I love Alberta. The big sky; the majestic mountains to the west; the badlands to the east and all the endless flat prairie in between offer a contrast of vistas that capture my heart and stimulate my imagination. 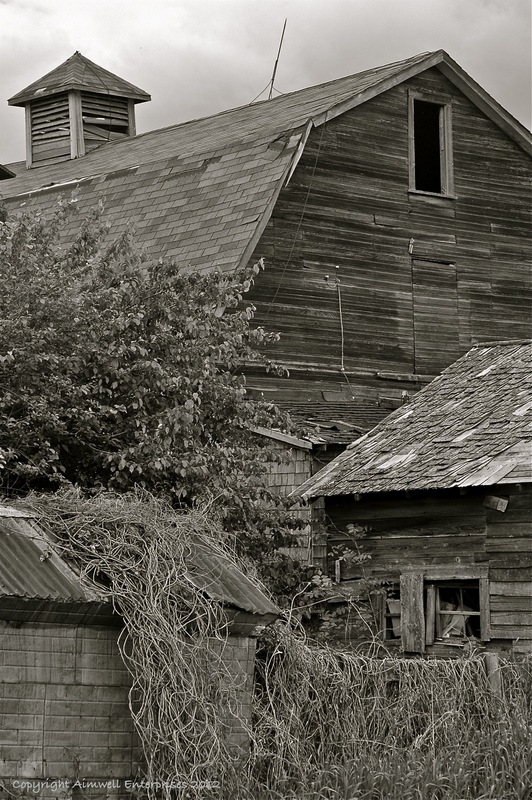 And few things stimulate the imagination more than a ghost town, of which Alberta has plenty. Old mining and agricultural communities lay abandoned all over the province just waiting to be explored. One morning last June while I was visiting my brother in Calgary we researched Alberta ghost towns online and discovered Rowley. Our imaginations bristling with anticipation we decided to ignore the stormy weather and make the two-hour drive to this virtually abandoned area north east of Calgary and near the badlands of Drumheller. When we arrived in town a distant storm was brewing to the southwest imparting an appropriately eerie atmosphere that only heightened our anticipation. In its heyday in the 1920s, Rowley’s population hovered around the 300 mark. Today it has 12 residents, and apart from the surreal image of a distant young woman pushing a child in a stroller along an empty roadway, we saw no one. Ours was the only car on dusty Main Street. We didn’t encounter a single soul. That and the impending storm made everything feel quite surreal. 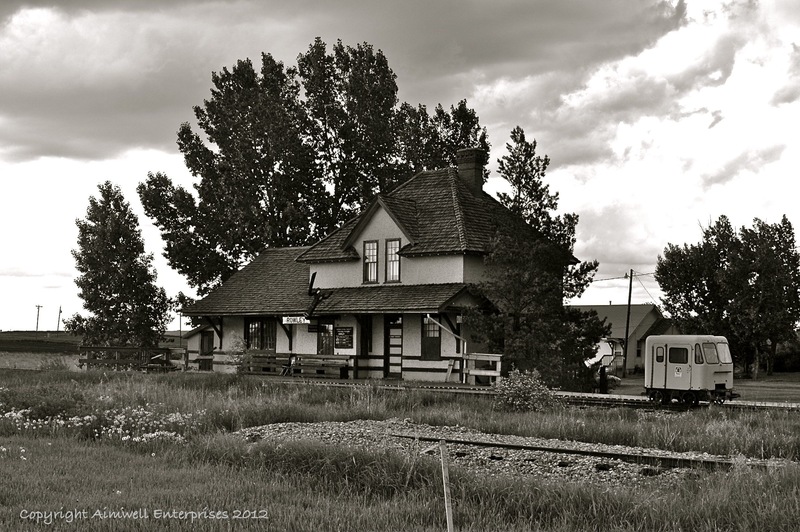 Rowley was a “train town” — a place where locals crowded the station daily to meet people, ship grain and receive supplies. Indeed, the original train station still stands and has been turned into a local museum, though the tracks were pulled up in the late 1990s when train service to the town was halted. 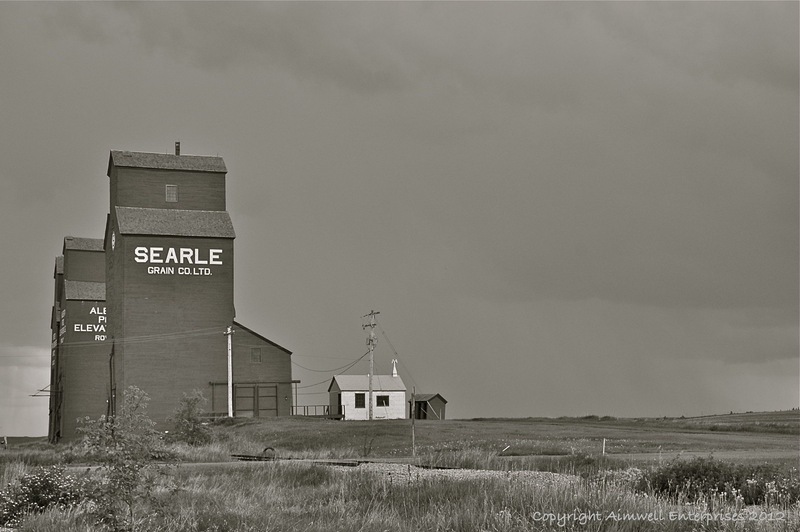 The grain elevators — an iconic symbol of prairie history — are still standing thanks to the vision of the residents who saw their potential as tourist attractions. They were purchased from the Alberta Wheat Pool in 1989 for $1 a piece and remain as beacons to the town for those travelling to visit by road. Many other original buildings from Rowley’s past, including the white wooden church preserved as a Provincial Historic Site and in use for special occasions only, stand as testament to a by-gone era. Some are still in use today; most are simply shadows of what used to be. As we wandered around town (we could have had a guided tour but we didn’t think that far ahead), the rumbles of thunder punctuated the occasional bird call and the whipping of grass in the stiffening breeze, but otherwise all was vast and embracing prairie silence. Prairie storms offer their own special drama, the landscape being so flat you can see the thunder heads approaching from miles away. As we kicked up dust and meandered from one abandoned building to the next, we were aware of the ever-encroaching storm and the fact that we didn’t a) want to be caught in a downpour or, more importantly, b) want to act as inadvertent lightning rods. Consequently, we had to curtail our visit after about an hour as conditions just became too volatile. 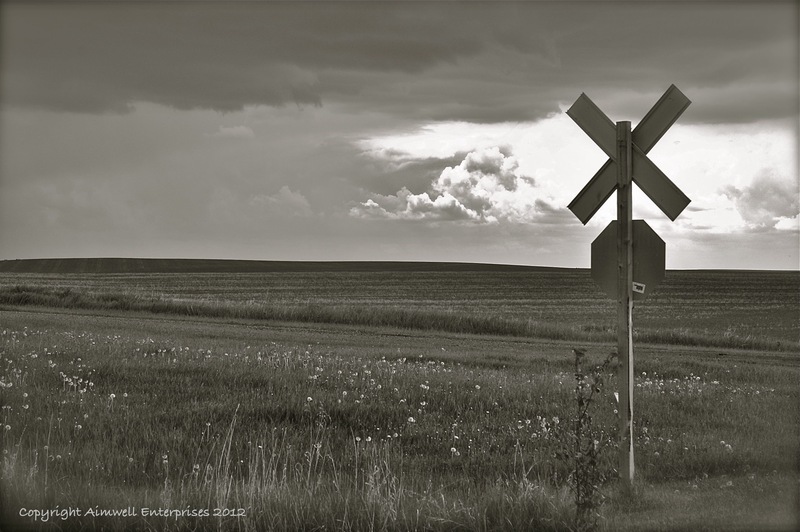 When I next visit Alberta (I hope later this year) I plan to return to Rowley and take the full guided tour so I can truly appreciate the history behind this enchanting prairie ghost town. 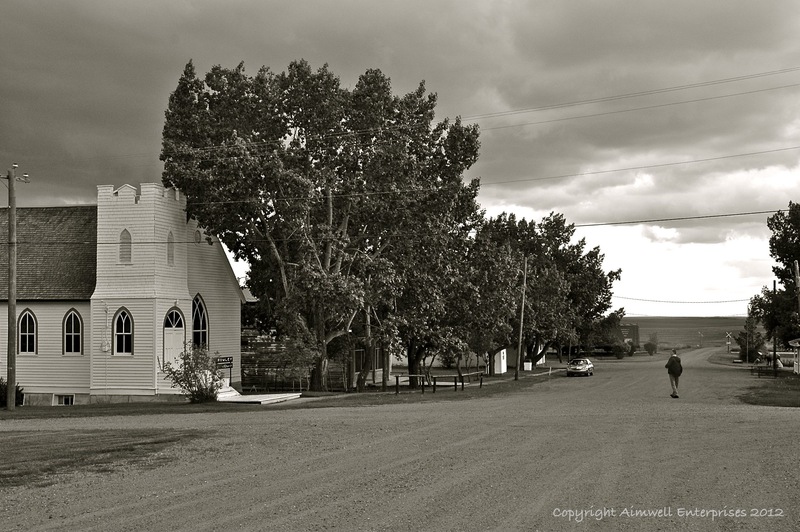 For more information on Rowley, Alberta and its history, click here. This entry was posted in Alberta, History, Landscapes, Photography, Travel, Uncategorized and tagged Alberta, Ghost towns, History, Photography, Rowley, Travel, Weather. Bookmark the permalink. I remember that trip. The little summer storm scudding in from the southwest, rumbling thunder rolling across the plain, resounding amongst the sullen and decrepit structures, echoes of former times brought to life by the energies of nature. There’s a reverence to Rowley. I encourage everyone who can to stop by and enjoy some true western shadows..